If you don’t already know, the Top End has had a cracker wet season after four dismal years. Darwin’s wet season stays wet – The wet season rainfall total to the end of March at Darwin Airport was 2299.6 mm, the 6th-highest wet season total at the site since records began in 1941. The official wet season continues until the end of April. A big Wet brings barramundi into the rivers in droves, and they will likely be biting right through the dry season. With Million Dollar Fish likely to be held again this year, and an El Nino mooted for next year, there has never been a better time to hit the Top End for some trophy barramundi fishing. If you are heading north, be sure to grab the 2017/18 edition of North Australian FISH FINDER fishing maps and the NT GPS Data Card … both these products will save you a fortune in wasted time. They are both compiled by Sunday Territorian fishing editor Matt Flynn, who has 20+ years of NT fishing knowledge, and regularly interviews the NT’s best known and most successful fishermen. 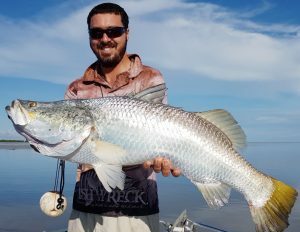 For those of you who need hard data to get the barra mojo moving, here are the results from the Kakadu Klash 2017 on the South Alligator River.